Deep in the commercial forests of northern Maine, trees are often valued for their lumber potential or for the ecological benefits they provide. But now a small and growing number of businesses from as far away as California may be investing in Maine’s woods as a way to address climate change. Trees absorb carbon dioxide – and larger trees means more of the greenhouse gas is locked away. In an effort to head off global warming, California and two Canadian provinces are requiring some companies to reduce greenhouse gas emissions or purchase carbon “offsets” in order to comply with government limits. The Nature Conservancy, a nonprofit forest landowner, hopes to connect those companies with the vast Maine woods in a way that could benefit both. The conservancy has agreed to manage 124,000 acres along the St. John River between Maine and Quebec as essentially a “carbon storage bank” for the next century. The conservancy gets paid for allowing trees to grow longer – and taller – on their lands by companies that purchase carbon offsets. At the same time, older and better-managed trees should ultimately yield higher-quality lumber when the time comes to harvest them, according to Nature Conservancy staff. Mark Berry, forest program director at The Nature Conservancy in Maine, said the project is a logical progression for land that the organization purchased back in 1998. Governments around the globe have toyed with all sorts of ideas for reducing emissions of greenhouse gases as scientists warn that humans are driving up atmospheric carbon dioxide levels to climate-altering levels. And while engineers are developing technologies to remove or “scrub” carbon dioxide from the air, trees are an all-natural and decidedly low-tech way to store carbon (at least temporarily). Like all photosynthesizing organisms, trees absorb carbon dioxide from the environment and turn it into sugars, cellulose and the other components that allow a tree to grow. Some of that carbon ends up being stored, or sequestered, in the tree’s woody structure until it decays or burns. Maine’s 17 million acres of forestland – covering 89 percent of the state, the highest in the nation – and the soils beneath them are storing an estimated 2.5 billion pounds of carbon dioxide, according to the U.S. Forest Service’s most recent figures. The only northeastern state to rank above Maine in total forest carbon storage is New York, which has a land mass more than 50 percent larger than that of the Pine Tree State. The idea behind carbon regulatory programs is that companies that emit greenhouse gases must either reduce emissions or pay to offset that greenhouse gas pollution elsewhere. The Nature Conservancy and the handful of other Maine landowners that have put forested acreage into carbon offset programs are participating in the Western Climate Initiative regulatory program operated by California, Quebec and Ontario. In other words, businesses in California or Canada that purchase the carbon offsets – which vary in price, depending on timing and supply/demand dynamics – will pay The Nature Conservancy to lock up more carbon on the St. John Forest lands for the next century in order to meet their own regulatory requirements. The conservancy is working with Climate Trust Capital, a U.S.-based private investment fund, to develop the forest carbon project. While the conservancy hasn’t sold any offsets yet on its Maine lands, California companies that have purchased offsets in other U.S. forests include Chevron, Tesoro Refining & Marketing, Calpine Energy Services and Shell Energy North America. 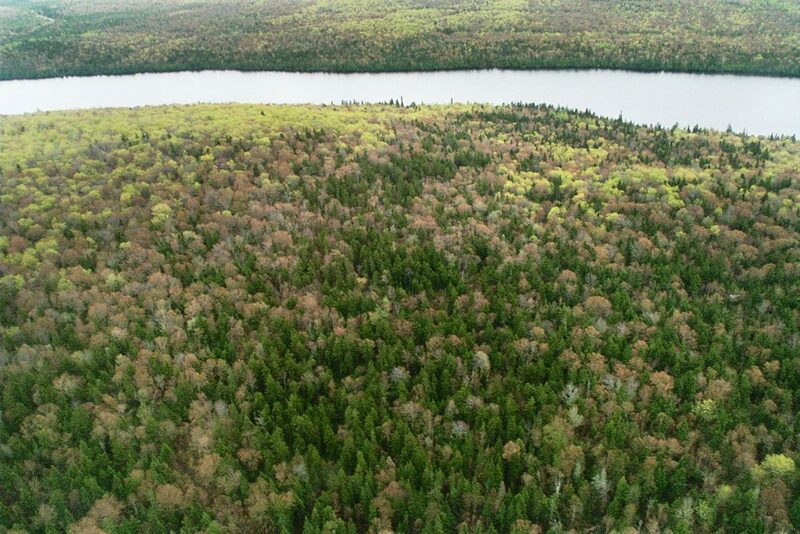 The Nature Conservancy purchased the St. John Forest property – roughly 160,000 acres along the Maine-Quebec border west of the Allagash Wilderness Waterway – 20 years ago this winter. The purchase was among the first in a wave of conservation-oriented land deals in Maine’s vast commercial timberlands as companies like Great Northern Paper and International Paper shed their land holdings. The organization has always harvested timber on parts of the land, selling wood to local mills to help cover the costs of maintaining a road network and invest in conservation projects. And some harvesting will continue even with the carbon storage project. But Berry said recent uncertainty in Maine’s timber markets spurred the organization to diversify revenue sources by expanding into maple sugaring last year and carbon offsets this summer. “From a financial standpoint, it puts us on a much more solid footing for conserving the property, especially the ecological preserve” not included in the carbon offset, Berry said. Such carbon forest projects are not new, nor is the underlying concept of “markets” where companies can buy and sell pollution offsets or credits as a way to address greenhouse gas emissions. Maine has been a party to a similar program, known as the Regional Greenhouse Gas Initiative, for more than a decade, and Australia as well as European governments have been attempting to tackle climate-warming carbon dioxide emissions with such cap-and-trade initiatives for years. In 2016, more than $660 million was spent on carbon offsets around the world, according to the “State of Forest Carbon Finance 2017” report by the nonprofit Forest Trends’ Ecosystem Marketplace. Those proceeds helped finance forest conservation, restoration or improvement projects on more than 29 million acres, much of it in the developing world. The North American carbon market has yet to develop into the large, complex system that many supporters envisioned, however. The California-driven Western Climate Initiative is the only major regulatory scheme, although there are “voluntary” markets for businesses or consumers that want to offset the greenhouse gas emissions they created while flying in an airplane or during their daily commute. After launching with significant hype – and some controversy – in 2007, the Western Climate Initiative is now down to just three participants with Ontario poised for withdrawal as well. That’s compared to the seven states and four Canadian provinces involved in early discussions. At 124,000 acres, the Nature Conservancy’s St. John Forest property is the largest carbon storage project in Maine to date and brings the state lands enrolled in either the California or voluntary markets to roughly 270,000 acres. Yet with more than 17 million acres of forestland – much of it meeting the sustainable forestry standards required of carbon offset programs – the carbon offset market has yet to take off in Maine. Eric Walberg, director of climate services at the Massachusetts-based scientific nonprofit Manomet, said the California market is likely to grow over the long term. But he noted that landowners in New England and elsewhere selling carbon offsets into the marketplace tend to be conservation-oriented rather than for-profit timber companies. A 2017 survey of seven larger landowners in Maine conducted by the organization Keeping Maine’s Forests found similar dynamics. While the respondents – all of whom already meet the sustainable forestry standards required for offsets – said they had considered participating in the programs, none had taken that next step. Landowners said low or fluctuating offset prices, restrictions on timber harvesting and the long-term nature of the agreements discouraged participation. “For many landowners, the decision whether to enter the carbon credit market is strictly a matter of financial return and risk,” reads the study. Critics of carbon offset programs – particularly the voluntary market aimed at individuals and companies – have questioned whether they are truly lowering emissions or helping the environment. Some critics point to surveys showing that individuals who purchased carbon offsets to compensate for greenhouse gas emissions for, say, airline travel may then feel justified in flying even more, thereby adding more climate-warming gases to the atmosphere. Others question if landowners vowing to store carbon as part of offsets sold in 2018 will still be living up to those obligations 30, 50 or even 100 years down the road. Berry, however, has had firsthand experience with forest carbon offsets before joining The Nature Conservancy last year. He headed Downeast Lakes Land Trust – a conservation group located in the Grand Lake Stream area of Washington County – when the organization became the nation’s first “improved forest management carbon project” outside of California. The organization agreed to long-term carbon management practices on 19,118 acres and, several years later, worked with another landowner on a 100-year carbon stocks agreement on another 22,000 acres. Berry said offset sales allowed Downeast Lakes Land Trust to purchase the 22,000 acres in Grand Lake Stream Plantation, permanently protecting it from development. The Passamaquoddy Tribe of Washington County has also put more than 90,000 acres of its forestlands into carbon offset programs as well, generating millions of dollars for tribal programs. 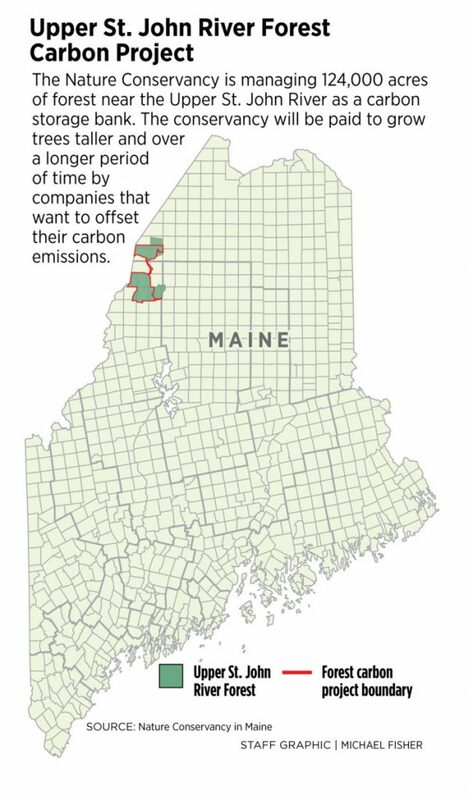 A handful of other organizations, such as the Appalachian Mountain Club, have also put land in Maine into carbon offsets. Berry said while The Nature Conservancy’s lands are a small portion of the offset program, he said the goals of California’s cap-and-trade program – a 40 percent reduction from 1990 emissions levels by 2030 – are an important contribution to addressing climate change. Meanwhile, the revenues from offset sales in California will reverberate several thousand miles east in Maine. “This project should generate revenues that will be helpful in all of our other forest conservation work in the future,” Berry said. Correction: This story was updated at 4:15 p.m. Tuesday, Aug. 14, 2018, to correct the name of Manomet’s director of climate services.